Two middle school BFFs experience the highs and lows of friendship, boys, sixth-grade politics, sister drama, and popularity in this funny and smart sequel to Project (Un)Popular! Perry can't figure out what she's doing wrong. Her best friend, Venice, has a boyfriend, making her feel totally left out—especially when Venice doesn't seem to have time for Perry or her problems. Yearbook has gotten a little bit better, but Anya is still out to get her, and instead of getting to work on something fun, Perry's stuck covering the "What's Hot" section. Even her attempt to help the geeks is backfiring. And when her older sister takes one of the biggest dorks at school under her wing, Perry feels completely betrayed. Now Hayes, a boy she barely knows, is hanging around and giving her stuff, and Perry panics. She doesn't want a boy to be crushing on her - especially Hayes. And social media makes everything more complicated. Is it even possible for Perry to turn things around and make sixth grade awesome? Totally Crushed was released in hardcover on May 9th, 2017. Recommended for ages 10 and up, grades 5 and up. 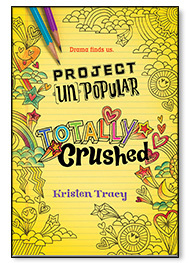 Totally Crushed is the second book in the Project (Un)Popular series.